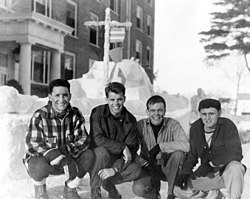 Robert F. Kennedy (second from left) completing his V-12 studies at Bates College in Lewiston. Pictured in background: a snow replica of a Naval boat. Navy officer candidates were required to complete the V-7 United States Naval Reserve Midshipmen's School program. It was a short course of eight months. The first month was spent at Indoctrination School, a "Boot Camp" for Officer Candidates that had Marine Corps drill instructors. Pre-Midshipmen's School was a preparatory four-month course teaching military skills like seamanship, navigation, ordnance, and how to behave like an officer. Midshipmen's School itself taught academic skills and was three months long. Graduates were commissioned as ensigns in the U.S. Naval Reserve and the majority entered into active duty with the U.S. fleet. Marine Corps candidates reported directly to boot camp and were later enrolled in a three-month Officer Candidate Course. Once complete, participants were commissioned as second lieutenants in the Corps. When the United States entered the Second World War on December 8, 1941, American colleges and universities suffered huge enrollment declines because men (at the time essentially all undergraduate students outside of the teacher training colleges were men, and at prime draft age) who would normally have gone into college (or would have remained enrolled until their degreed course of study was completed) were either drafted, volunteered their enlistment into service, or were preemptively diverted from their university studies into military enlistment/officer commissioning exempt technical civilian jobs in war-related industries. As a result, some colleges worried they would have to close their doors, essentially for the duration of the conflict. Helping offset this, the federal government backed U.S. Navy run V-12 Program paid tuition to participating colleges and universities for college courses that were taught to qualified candidates. Those eligible included naval enlisted personnel who were recommended by their commanding officers, Navy and Marine Corps ROTC members, and high school seniors who passed a qualifying exam. After the V-12 Program was established on July 1, 1943, public and private college enrollment increased by 100,000 participants, helping reverse the sharp wartime downward trend. Depending on the V-12 enrollees' past college curriculum, they were enrolled in three school terms, or semesters, which lasted four months each. Students were paid $50 per month, required to wear service uniforms, and engaged in rigorous physical training. Captain Arthur S. Adams, from the Training Division of the Bureau of Naval Personnel, was the officer-in-charge of the V-12 program. Richard Barrett Lowe, future Governor of Guam and American Samoa, was one of its early commanding officers. The primary purpose of the program was to "give prospective Naval officers the benefits of a college education in those areas most needed by the Navy." The Navy did not want to interrupt the "normal pattern of college life," but instead, the goal was for the participants to complete a degree in their field of study; while supplementing their course work with Navy classes, for which the colleges awarded regular academic credits. The Navy's plan was to contract not only classroom, mess hall, and dormitory space for a "stipulated amount of instruction," but also plans were made to make use of each campus' instructors and administration; a much needed infrastructure that was already in place. The students were expected to "have the benefits of faculty counseling, of extracurricular activities -- in short, the best undergraduate education the colleges can offer." Vice Admiral Randall Jacobs, USN, the Chief of Naval Personnel, announced plans for the joint venture between the Navy and the colleges and universities during a national conference which was held at Columbia University on May 14 and 15, 1943. Administrators from 131 colleges and universities under contract with the Navy attended the conference along with Naval officers from the Bureau, who were designated as the administrators of the V-12 Program. The colleges and universities were "expected to keep academic standards high" and were ultimately placed in charge of the implementation, which was accomplished in six months. Captain Adams stated that the Navy had no intent of "taking over the colleges," but instead, the Navy wanted to take "full advantage" of each institution's academic resources and to make use of the experience and knowledge of the college administrators. This included all details of the program such as the length of the college day, scheduling of exercises, meals, recreation, textbooks, and class time. The V-12 program while economically and functionally beneficial to undergraduate colleges and universities in maintaining quasi-normal educative functionality during a general mobilization of all manpower for the war; also met and exceeded critical needs of the military. The numbers of officers needed at sea; and, in the many and multiple theaters of the conflict, given the global scope of the war, were not only beyond the capacity of the services' officer academies, the requirement was well beyond the capacity of the uniformed services' officer corps itself, entirely. Enlisting (by contract) colleges and universities to undertake part of the officer candidate education mission, freed the Navy & War department's officer corps to concentrate principally upon the prosecution of the war; from the very beginning of the conflict. And to not have to divert from the outset of the war, all their energies to the building up of a global uniformed officer corps to command the forces. In addition World War II was an unprecedented technical challenge for all the armies/navies who fought in it. The World War II US Navy's need for college trained officers would have demanded such a program to create in the cadre of officers, men who possessed the technical qualifications demanded for the specialized scientific, organizational, and management tasks performed in the waging of a modern war. During the advent of World War II, the U.S. Navy turned to liberal arts colleges to provide a basic education for their recruits. Alfred J. Eggers served as NASA's Assistant Administrator for Policy from January 1968 through March 1971. After that he accepted a position as Assistant Director for Research Applications at the National Science Foundation. 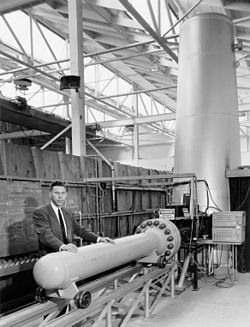 Dr. Eggers came to the NACA (National Advisory Committee for Aeronautics) Ames Aeronautical Laboratory in 1944 from the Navy's V-12 college program. M. Scott Carpenter, Project Mercury astronaut (Colorado College and Saint Mary's College of California). Bernard M. Gordon, inventor and philanthropist. Robert Earl Roth Radiology Oncologist. The first Radiology Oncologist in the state of Alabama, he became chairman of Radiology and Oncology at the University of Alabama-Birmingham Medical school at age 32, and Chairman of Radiology Oncology once the two disciplines split. Educated through the V-12 program at Columbia University for undergrad and the University of Illinois for medical school, with residency at Vanderbilt University for Radiology and a fellowship in Radiology Oncology. (Columbia University University of Illinois College of Medicine Vanderbilt University). Harold Lyman Ryan, served as a federal judge on the United States District Court for the District of Idaho. Leon Silver, geologist who was instrumental in training the Apollo Program astronauts in field geology. Ernest M Zaiser Jr - General Manager McDonnell Douglas F-4 Technical Services, Representative Director McDonnell Douglas Japan, Vice President Operations McDonnell Douglas F-15 Technical Services (Yale University}. Zig Ziglar, author, salesperson, and motivational speaker (University of South Carolina). ^ a b c d e f g h i j k l m n o p q r s t Henry C. Herge. Navy V-12, Vol. 12. Turner Publishing Co., 1996. Archived from the original on April 25, 2016. Retrieved September 22, 2011. ^ "Ohio Has 14 Among Navy Reserve Grads". Steubenville Herald Star. Steubenville, Ohio. December 12, 1940. ^ Dakota State University (2004). "Richard Barrett Lowe". American Samoa. Archived from the original on 1 June 2009. Retrieved 31 July 2009. ^ a b "The V-12 Program". Williamstown, Massachusetts: Williams College. 2011. Archived from the original on November 22, 2011. Retrieved September 27, 2011. ^ a b c d e f g h i j k l m n o p q r s t u v w x y z aa ab ac ad ae af ag "U.S. Naval Activities World War II By State". HyperWar Foundation. 2011. Archived from the original on September 24, 2015. Retrieved October 6, 2011. ^ "Milestones in UAM History" (PDF). Monticello, Arkansas: University of Arkansas at Monticello. 2011. Archived from the original (PDF) on October 11, 2011. Retrieved September 30, 2011. ^ "The Former Deans of FCB". Flagstaff, Arizona: Northern Arizona University. 2011. Archived from the original on February 20, 2006. Retrieved September 28, 2011. ^ "Yellow Jacket Player, Lee Tressel – 1943–47". Berea, Ohio: Baldwin-Wallace College. 2011. Archived from the original on October 13, 2012. Retrieved September 28, 2011. ^ "July 1943: The Navy arrives". Lewiston, Maine: Bates College. 2011. Archived from the original on September 27, 2011. Retrieved September 25, 2011. ^ "Mountain Boys to Admirals". Berea, Kentucky: Berea College. 2011. Archived from the original on March 31, 2012. Retrieved September 27, 2011. ^ a b c "Naval Training and Education Yearbooks in the Navy Department Library". Department of the Navy. 2011. Archived from the original on July 9, 2006. Retrieved September 25, 2011. ^ "Our History". Bloomsburg, Pennsylvania: Bloomsburg University. 2011. Archived from the original on October 14, 2011. Retrieved October 3, 2011. ^ "Our History". Bowling Green, Ohio: Bowling Green State University. 2011. Archived from the original on October 11, 2011. Retrieved September 25, 2011. ^ "Bucknell of Yesteryear & Today". Lewisburg, Pennsylvania: Bucknell University. 2011. Archived from the original on September 6, 2011. Retrieved September 28, 2011. ^ "Oral History – Allen J. Acosta" (PDF). Pasadena, California: California Institute of Technology. April–May 1994. Archived (PDF) from the original on June 18, 2010. Retrieved September 29, 2011. ^ "St Charles Hall, Carroll College, Helena, Montana". Helena, Montana: Carroll College. 2011. Archived from the original on March 30, 2012. Retrieved September 27, 2011. ^ "V-12: The Navy Docks at Mossy Creek" (PDF). Knoxville, Tennessee: Carson-Newman College. 2011. Archived (PDF) from the original on April 3, 2012. Retrieved September 29, 2011. ^ "Deceased Classmates in the Year 1950–1959". United States Naval Academy. 2011. Archived from the original on March 19, 2013. Retrieved September 29, 2011. ^ Warren Giese Rejects Central Coaching Job, Ludington Daily News, March 24, 1951. ^ a b c d e f g h i j "U.S. Naval Activities World War II – Missouri". HyperWar Foundation. 2011. Archived from the original on November 21, 2011. Retrieved October 9, 2011. ^ Porter, David L. (2005). Basketball: a biographical dictionary. Greenwood Publishing Group. Archived from the original on June 19, 2013. Retrieved September 29, 2011. ^ "When the Navy docked on the Hill". Worcester, Massachusetts: College of the Holy Cross. 2011. Archived from the original on April 1, 2012. Retrieved September 28, 2011. ^ a b "U.S. Naval Activities World War II – Minnesota". HyperWar Foundation. 2011. Archived from the original on November 21, 2011. Retrieved October 6, 2011. ^ "World War II Wartime Efforts". New York City: Columbia University. 2011. Archived from the original on June 29, 2010. Retrieved September 25, 2011. ^ "Records of the Bureau of Naval Personnel". National Archives. 2011. Archived from the original on September 27, 2011. Retrieved September 25, 2011. ^ "Archives of DePauw University". Greencastle, Indiana: DePauw University. 2011. Archived from the original on September 16, 2006. Retrieved September 27, 2011. ^ "Navy yearbook, Dickinson State Teachers College". Dickinson, North Dakota: Dickinson State Teachers College. 1943. Archived from the original on April 6, 2012. Retrieved September 29, 2011. ^ "About the School". Madison, New Jersey: Drew University. 2011. Archived from the original on October 18, 2011. Retrieved September 27, 2011. ^ a b "Navy V-12 Program". Durham, North Carolina: Duke University. 2011. Archived from the original on March 5, 2011. Retrieved September 28, 2011. ^ "Donald W. Tendick, Sr., Memorial". Historical Marker Database. 2011. Archived from the original on September 16, 2011. Retrieved September 26, 2011. ^ a b c "The War and Post War Years". Atlanta, Georgia: Emory University. 2011. Archived from the original on September 27, 2011. Retrieved September 26, 2011. ^ "Naval ROTC". Atlanta, Georgia: Georgia Institute of Technology. 2010. Archived from the original on February 7, 2012. Retrieved September 28, 2011. ^ "Gonzaga History World War II". Spokane, Washington: Gonzaga University. 2011. Archived from the original on April 7, 2012. Retrieved September 28, 2011. ^ Waldhauser, Steve (2011). "Songs of Thy Triumph – A Short History of Gustavus Adolphus College" (PDF). St. Peter, Minnesota: Gustavus Adolphus College. Archived (PDF) from the original on November 12, 2011. Retrieved September 26, 2011. ^ "An army of good men". Hampden Sydney, Virginia: Hampden–Sydney College. 2011. Archived from the original on January 11, 2012. Retrieved September 26, 2011. ^ "Harvard and World War II research guide". The President and Fellows of Harvard College. 2011. Archived from the original on April 2, 2012. Retrieved September 30, 2011. ^ a b c d e f g h i j k l m n o p q r s t u v w x "U.S. Naval Administration in World War II". HyperWar Foundation. 2011. Archived from the original on January 12, 2012. Retrieved September 29, 2011. ^ "About IIT NROTC : History". Chicago: Illinois Institute of Technology. 2011. Archived from the original on February 1, 2012. Retrieved September 28, 2011. ^ "1948 Bob Quin Award – Don Anderson". McWhirter's. 2011. Archived from the original on May 26, 2011. Retrieved September 29, 2011. ^ "Veterans Program". University Heights, Ohio: John Carroll University. 2011. Archived from the original on April 1, 2012. Retrieved September 29, 2011. ^ "Call to Duty, Lawrence University's V-12 Program". Outagamie County Historical Society (OCHS). 2002. Archived from the original on February 8, 2012. Retrieved September 27, 2011. ^ a b c "U.S. Naval Activities World War II – Wisconsin". HyperWar Foundation. 2011. Archived from the original on November 21, 2011. Retrieved October 6, 2011. ^ "MIT Institute Archives & Special Collections". Cambridge, Massachusetts: Massachusetts Institute of Technology. 2011. Archived from the original on May 23, 2012. Retrieved October 1, 2011. ^ a b Neil R., McMillen (1997). Remaking Dixie: the impact of World War II on the American South. University Press of Mississippi. Archived from the original on November 5, 2013. Retrieved October 2, 2011. ^ Mathews, Madison (2011). "Milligan College once Navy training center during World War II". Johnson City Press. Archived from the original on April 5, 2012. Retrieved September 29, 2011. ^ "V-12 Program". Jackson, Missouri: Millsaps College. 2006. Archived from the original on March 31, 2012. Retrieved September 27, 2011. ^ a b c d e f g h i "U.S. Naval Activities World War II – Pennsylvania". HyperWar Foundation. 2011. Archived from the original on November 21, 2011. Retrieved October 6, 2011. ^ "History and Heritage". Peru, Nebraska: Peru State College. 2011. Archived from the original on February 5, 2011. Retrieved October 1, 2011. ^ "Dr. Edward W. Burke, Former Professor Passes". King College. 2010. Archived from the original on April 19, 2012. Retrieved September 29, 2011. ^ a b "U.S. Naval Activities World War II – North Dakota". HyperWar Foundation. 2011. Archived from the original on November 21, 2011. Retrieved October 6, 2011. ^ "History". Arlington, Texas: University of Texas at Arlington. 2011. Archived from the original on August 11, 2011. Retrieved September 29, 2011. ^ "Men and Women of the Greatest Generation" (PDF). Navyleague Councils Support. 2011. Archived (PDF) from the original on May 25, 2013. Retrieved September 29, 2011. ^ Quinn, Patrick (Winter 1993). "Wartime on Campus" (PDF). Chicago, Illinois: Northwestern University – Northwestern Perspective. Archived (PDF) from the original on 2008-05-09. Retrieved 2008-07-07. ^ "Oxy Trivia". Los Angeles, California: Occidental College. 2011. Archived from the original on May 19, 2012. Retrieved September 28, 2011. ^ "New Recruits Arrive for Navy V-12 Program" (PDF). State College, Pennsylvania: Pennsylvania State University, The Collegian. July 3, 1943. Archived from the original (PDF) on April 2, 2012. Retrieved September 29, 2011. ^ Richard D. Challener, "The Response to War," Princeton History 1992 11: 48–65. ^ a b "Warren Harding starting V-12 program at Purdue". West Lafayette, Indiana: Purdue University. 2011. Archived from the original on April 2, 2012. Retrieved September 29, 2011. ^ "Shots from RPI". Troy, New York: Rensselaer Polytechnic Institute. 2011. Archived from the original on April 2, 2012. Retrieved September 25, 2011. ^ "V-12 Naval Training at St. Ambrose College". Davenport, Iowa: Saint Ambrose University. 2007. Archived from the original on April 25, 2012. Retrieved September 28, 2011. ^ "2LT Edward Lawrence "Larry" Phelan". Canton (village), New York: St. Lawrence University. 1998. Archived from the original on September 7, 2008. Retrieved September 29, 2011. ^ "Veterans Memorial". Winona, Minnesota: Saint Mary's University of Minnesota. 2011. Archived from the original on September 19, 2011. Retrieved October 2, 2011. ^ "1944 Marine V-12 SLI Yearbook". SLI. 2011. Archived from the original on March 16, 2016. Retrieved September 28, 2011. ^ a b Davis, Ellen (June 13, 2008). "The establishment of Southwestern University". *Georgetown, Texas: Community Impact. Archived from the original on April 24, 2010. Retrieved September 28, 2011. ^ "Daily Gazette". Swarthmore, Pennsylvania: Swarthmore College. 2011. Archived from the original on December 14, 2012. Retrieved September 29, 2011. ^ "Tufts and the V-12 Program". Medford, Massachusetts: Tufts University. 2011. Archived from the original on April 5, 2012. Retrieved September 27, 2011. ^ "Garnet and Gray: ReUnion". Schenectady, New York: Union College. 2003. Archived from the original on November 11, 2005. Retrieved September 29, 2011. ^ a b "Guide to the Navy V-12 program archives – University of California, Berkeley – 1943–1946" (PDF). Online Archive of California. 2011. Archived (PDF) from the original on March 29, 2012. Retrieved September 25, 2011. ^ Burke, Colin B. (26 February 2001). Robert M. Hayes, Transcript of an Interview Conducted by Colin B. Burke at Los Angeles, California on 26 February 2001 (PDF). Philadelphia, PA: Chemical Heritage Foundation. ^ a b c d e f g h i j "U.S. Naval Activities World War II – District of Columbia". HyperWar Foundation. 2011. Archived from the original on November 21, 2011. Retrieved October 6, 2011. ^ "From Basketball to Covert Ops: E. Henry Knoche". The Washington Post. Archived from the original on 2011-09-26. ^ "Memorial for veterans planned at ISU". Pocatello, Idaho: Idaho State Journal. 2010. Archived from the original on January 3, 2013. Retrieved September 29, 2011. ^ a b c "Alumni Association Scholarships". Louisville, Kentucky: University of Louisville. 2011. Archived from the original on December 10, 2011. Retrieved September 25, 2011. ^ "World War II". Coral Gables, Florida: University of Miami. 2011. Archived from the original on April 7, 2012. Retrieved September 29, 2011. ^ a b "Michigan in the News". Ann Arbor, Michigan: University of Michigan. 2011. Archived from the original on June 11, 2011. Retrieved September 29, 2011. ^ a b "Our History". Minneapolis, Minnesota: University of Minnesota. 2011. Archived from the original on December 28, 2012. Retrieved September 28, 2011. ^ a b "The Beginning of NROTC at UNC Chapel Hill". Chapel Hill, North Carolina: University of North Carolina at Chapel Hill. 2011. Archived from the original on October 6, 2011. Retrieved September 28, 2011. ^ "Inventory: Naval Flight Preparatory School. V-5, V-7, V-12 Records" (PDF). Philadelphia, Pennsylvania: University of Pennsylvania. 2011. Archived (PDF) from the original on June 25, 2010. Retrieved September 28, 2011. ^ "The News about the University of Rochester, 1944". GenWeb Monroe County. 2010. Archived from the original on April 2, 2012. Retrieved September 25, 2011. ^ Lesesne, Henry H. (2001). A History of the University of South Carolina, 1940–2000. University of South Carolina Press. p. 27. ^ a b "Guide to the University of Utah College of Medicine certificates, 1947–1949". Salt Lake City, Utah: University of Utah School of Medicine. 2011. Retrieved October 2, 2011. ^ Stratts, Holly (2002). "Amidst the Depression and War, Progress Still Prevails". Villanova, Pennsylvania: Villanova University. Archived from the original on April 6, 2012. Retrieved September 29, 2011. ^ "History of Phi Gamma Delta in Indiana/ Psi History:". Crawfordsville, Indiana: Wabash College. 2011. Archived from the original on March 31, 2012. Retrieved September 30, 2011. ^ "McDonald, Billy Ray "B.R."". The Dwight D. Eisenhower Foundation. 2000. Archived from the original on December 24, 2011. Retrieved September 29, 2011. ^ a b c d e f g h i "U.S. Naval Activities World War II – New York". HyperWar Foundation. 2011. Archived from the original on November 21, 2011. Retrieved October 9, 2011. ^ "Guide to the Navy V-5 and V-12 Training Units Collection, 1941–1944". Middletown, Connecticut: Wesleyan University. 2011. Archived from the original on September 27, 2011. Retrieved September 25, 2011. ^ "Guide to the Whitman College V-5 and V-12 Program Records 1942–1991". NWDA. 2011. Retrieved September 28, 2011. ^ "Whitman News 1942–1943". Walla Walla, Washington: Whitman College. 1943. Archived from the original on April 2, 2012. Retrieved October 1, 2011. ^ Nichols, D.J. (1987). "AASP Primary Records Program". U.S. Geological Survey. Archived from the original on September 7, 2011. Retrieved September 29, 2011. ^ John, Finney (1997). "Yale Class of 1945 – From White Shoe to Combat Boot". Yale Alumni Magazine. New Haven, Connecticut: Yale University. Retrieved October 1, 2011. ^ a b c d "U.S. Naval Activities World War II – Massachusetts". HyperWar Foundation. 2011. Archived from the original on November 21, 2011. Retrieved October 6, 2011. ^ a b "U.S. Naval Activities World War II – Indiana". HyperWar Foundation. 2011. Archived from the original on November 21, 2011. Retrieved October 6, 2011. ^ "U.S. Naval Activities World War II – Maryland". HyperWar Foundation. 2011. Archived from the original on November 21, 2011. Retrieved October 9, 2011. ^ "Biography of Victor Parsonnet". Heart Rhythm Society. December 23, 1998. Archived from the original on December 10, 2011. Retrieved September 29, 2011. ^ a b c "U.S. Naval Activities World War II – California". HyperWar Foundation. 2011. Archived from the original on September 7, 2011. Retrieved October 6, 2011. ^ Goettling, Gary (2011). "World War II and the Tech Connection". Georgia Tech Alumni Association. Archived from the original on December 23, 2005. Retrieved September 29, 2011. ^ a b "Brigadier General (Dr.) Herbert V. Swindell". U.S. Air Force. April 1979. Archived from the original on December 12, 2012. Retrieved September 29, 2011. ^ Martin, Douglas. "Henry S. Coleman, 79, Dies; Hostage at Columbia in '68" Archived 2016-09-16 at the Wayback Machine, The New York Times, February 4, 2006. Accessed September 12, 2009. ^ Jim Brahos (1944-12-27). "Lew Wallace Third in State But 1945 Path Is Rougher". Hammond Times. ^ "Paul Newman – Biographies in Naval History". 2011. Archived from the original on September 3, 2011. Retrieved September 25, 2011. ^ "Zufall Health Centers Mission and History". This page was last edited on 11 January 2019, at 21:12 (UTC).